Another factor in developing varicose veins is doing work that requires standing or sitting for long periods of time. This deprives the veins in the legs of the regular blood flow that occurs when the leg muscles flex during walking and other activities. As you go about your day, blood flows from your heart to the rest of your body through arteries. It then returns to the heart through veins. It first collects in small superficial veins, then flows into larger veins that have one-way valves to keep the blood from flowing backward. In healthy veins these valves make sure the blood is directed upward and inward toward the heart and the lungs. But when one or more of these valves don’t work properly, some of the blood leaks and flows back down the leg. This causes the vein to overfill with blood, making the branches of those small superficial veins bulge under the skin. The deep veins can withstand this pressure, partly because of their construction and partly because they’re surrounded by muscles. But over time this extra pressure can cause superficial veins to become distended. And without treatment, chances are they will become varicose veins. As these superficial veins weaken further, more and more blood accumulates under pressure and causes swelling. Eventually, the valves no longer close at all, and blood begins to pool in the superficial veins of the lower leg. These engorged, ropelike veins—varicose veins—are abnormal, yet they are common and mostly affect women. Two or more of these symptoms at or near the same time may be a sign of varicose veins. A rash or skin ulceration on the ankle or lower leg may also be an indication of varicose veins. Be sure to consult your physician, especially if you see large, ropelike, twisted-looking veins that appear deep bluish in color. Varicose veins are common and aren’t generally associated with more-severe health problems, but they can be painful and unattractive and may worsen over time. Varicose veins can cause legs and feet to swell, a sense of fatigue or restlessness in leg muscles, and throbbing and cramping at night. The skin surrounding the veins may also itch and burn. In severe cases venous insufficiency may develop, causing irregular circulation. This can lead to problems like deep-vein thrombosis (a blood clot). Patients with venous insufficiency often benefit from medical treatment. Left untreated, varicose veins can lead to swelling, increased pain, skin discoloration, and ulcers. These ulcers are difficult to treat and can easily become infected and painful. When it comes to varicose veins, early diagnosis and treatment are key. Although the underlying cause of varicose veins is unknown, a number of risk factors have been identified. Heredity. Varicose veins tend to run in families. If your parents, grandparents, aunts, uncles, or other family members have had varicose veins, it’s likely that you’ll develop them. A defect in the vein walls or valves is the greatest contributing factor in 70 percent of cases. Age. 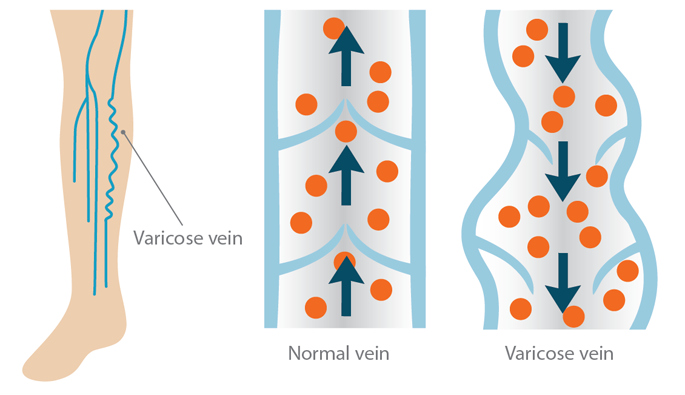 Varicose veins are a progressive condition that worsens in frequency and severity with age. As we age, elastic fibers in our bodily tissues break down, leading to wrinkles in the skin and weakening of the blood vessels. Gender. Primarily due to the production of progesterone (one of the major female hormones), women are more likely than men to get varicose veins—by a ratio of approximately four to one. Obesity. Excess body weight increases the pressure on vein valves and can lead to their weakening. Hormonal changes. Changes in hormone levels brought on by puberty, contraceptives, pregnancy, menopause, and hormone replacement therapy are risk factors for varicose veins. Pregnancy. Increased progesterone levels, blood volume in the body, and pressure on the pelvic veins all contribute to the formation of varicose veins. 70 percent of women develop venous (vein-related) problems during pregnancy. These include fluid retention; pain, heaviness, or fatigue in the feet and legs; mild edema (swelling in the feet and legs); and spider veins. 20 percent of pregnant women develop full-blown varicose veins. Heredity is a major factor, but hormonal changes and the baby’s increasing weight place additional stress on the veins in the mother’s legs. 50 percent of new mothers suffer from vein-related conditions for the rest of their lives, with one in 10 affected by varicose veins indefinitely. Untreated varicose veins can lead to chronic edema, phlebitis (vein inflammation), thrombophlebitis (vein inflammation associated with a blood clot), and blood clots. Occupation. People whose jobs require them to stand or sit for long periods of time are at greater risk of developing varicose veins. When sitting or standing still, the valves in the veins in the legs are under increased pressure, which eventually weakens them. 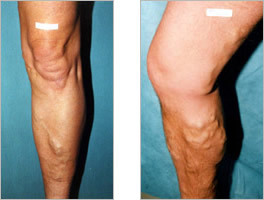 Sclerotherapy, Endovenous Ablation, and Vein Stripping are several of the methods for treating varicose veins.